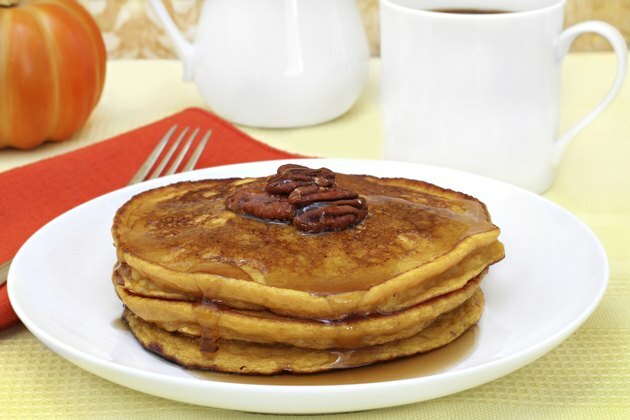 Pecan pancakes are a staple of the Cracker Barrel breakfast menu, which features classic, diner-style American fare. Each serving of this dish comes with three pecan-filled buttermilk pancakes, which are topped with butter and served alongside the restaurant's brand of syrup. You're responsible for pouring your own syrup, so nutritional values will vary with a lighter or heavier hand. Each Cracker Barrel pecan pancake contains about 175 calories, and you'll consume 525 calories by finishing your plate. That plate also contains about 12 grams of fat -- half of which is saturated -- as well as 51 grams of carbohydrates and 12 grams of protein. It has about 750 milligrams of sodium and no significant amount of any other vitamin or mineral. Butter contributes about 100 calories and 12 grams of fat per tablespoon. If you add syrup, count 190 calories for each 1/4 cup. That includes 48 grams of carbohydrates -- 46 of which are sugars -- and no significant amounts of other nutrients.